A&A Rental Station is your go-to source for scaffolding rentals in the Alexandria, NOVA, and the Washington DC metro area. No matter the scope of your project, we have a well-stocked inventory to provide you with the equipment you need to get the job done right. We offer both interior and exterior scaffolding in a variety of sizes from professional-quality leading brands. Our equipment is easy to use and safe to operate, so you won’t need to stress about anything other than the project at hand. Delivery service is available for all rentals. We’ll bring the equipment to you, so you can focus on the job at hand. They must be returned clean and in original condition. There will be an additional charge for any missing, damaged, or dirty components. 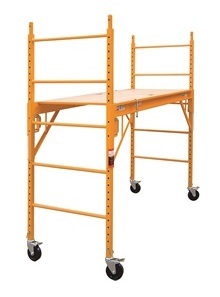 Let A&A Rental of Alexandria, VA handle all your scaffolding rental equipment needs. Our inventory is well stocked with everything you need to get the job done right no matter the project size. We offer everything from interior to exterior scaffolding, large and small, from our selection of trusted professional-quality top brands. Our equipment is easy to operate and safe to use.